Somebody stole my brown sugar ...cookies...oatmeal raisin cookies that became oatmeal molasses cranberry chocolate chip cookies! After picking up the kids from school this evening, I passed by the farmer's market to see if they were open for the season. One market was still closed and the other was open for business. I picked up some herbs and cucumbers and then I eyed some homemade oatmeal raisin cookies. The large soft kind that just melts in your mouth...I was tempted. I decided to make some myself, packed the kids in the car and headed home to cook. The cookies didn't turn out like I planned...they turned out better. I had planned oatmeal raisin cookies or galettes as I prefer to call them but I was tired and for some reason I could not be bothered to look for the raisins when the cranberries were sitting there staring at me. Then the chocolate chips were on the counter just waiting to join the party so I had to include them. And finally the sugar part...I had researched a few recipes and they all called for brown sugar. No problem! Walk into the pantry to get the brown sugar...no brown sugar...uh where's the brown sugar? Uh oh...all the ingredients are mixed and I have NO BROWN SUGAR!!! Ever so quick thinking...yours truly decided to substitute the brown sugar for regular sugar and molasses...best idea EVER! The following recipe took 30 minutes to make from start to finish including clean up...give it a spin and if you don't have molasses use brown sugar...lol! 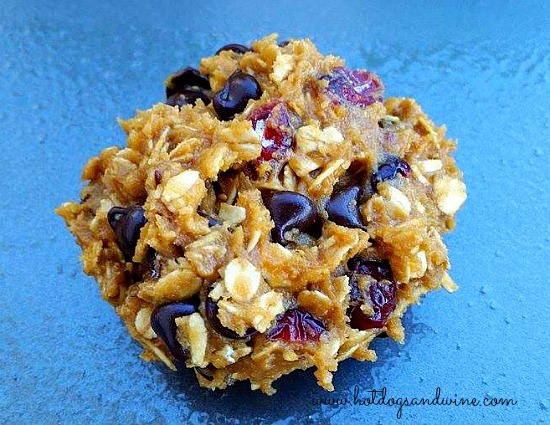 Combine both bowls of ingredients and form large balls of the mixture; approximately 1/4 cup. Place the balls on a cookie tray that has been sprayed with cooking spray. Bake in a 375 degree oven for 10-12 minutes. Let cool and enjoy!